I’m starting a series to finish out the year that will look back at some of the best matches in 2016. Today we start with wrestling announcer and super fan Nick Maniwa, whose favorite match came from NXT. See an excerpt of the match here, then go to the Network to watch in its entirety! What does it mean to be King of the Deathmatches? What would it mean to win IWA Mid-South’s King of the Deathmatch tournament? I posed that question to several of this year’s competitors. Here’s what they had to say. 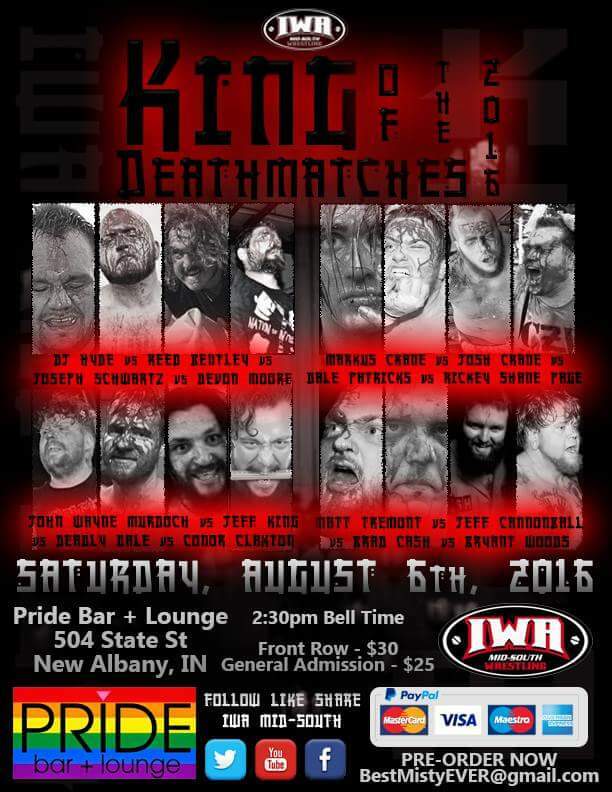 King of the Deathmatch begins August 6th at 3 PM at Pride bar + lounge, 504 State Street in New Albany, Indiana. Front row is already sold out, but seats are still available for $25. Email BestMistyEVER@gmail.com for ticket information. Special thanks to Righteous Jesse of the Kick Out at Two Podcast for his assistance on this story!